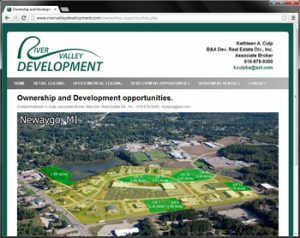 RVD is a real estate development in Newaygo, MI, slightly outside of Grand Rapids, and has a huge apartment complex, many industrial, commercial and office spaces. It was very cool to be a part of something like this. When I had initially met with the clients, they where looking for something that would look good both on desk tops, aka normal computers, as well as mobile devices, so obviously going with a responsive website is a must. 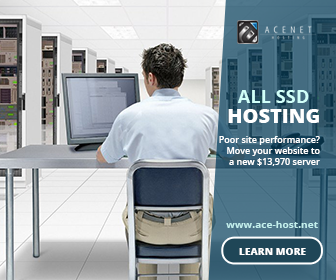 The client was also very interested in making sure that the site ranked well. The site overall is meant to generate leads, inbound marketing, as well as showing off where they are currently at with the project, and what is still available. The SEO so far has just boiled down to doing the appropriate keyword research and using an LSI Keyword Strategy to insure we are getting the most bang for our buck, and targeting the appropriate terms by search volume for what we need to target. The only tough thing here is that overall the client does not want a ton of static content on the site, which is one easy way of targeting for a ton of search strings, so here I had to be smart and do a lot of the targeting strictly with meta-data and a small amount of static text and external linking. She ranks well now, but with what I just did it will rank even better. 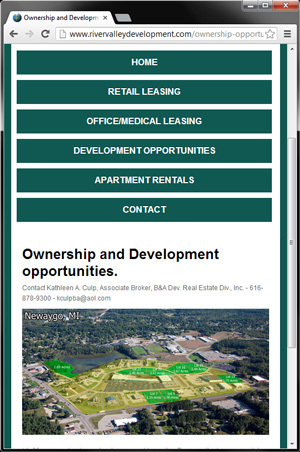 Visit www.rivervalleydevelopment.com today and see for yourself.